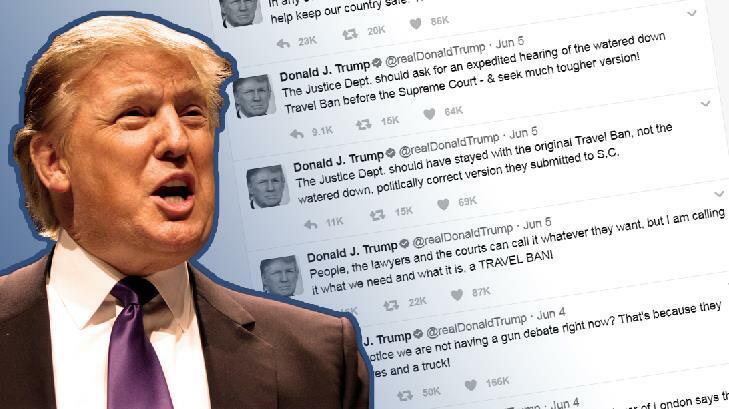 “People, the lawyers and the courts can call it whatever they want, but I am calling it what we need and what it is, a TRAVEL BAN!” Trump’s tweet declared. Legal experts believe Trump’s latest tweets will likely destroy any possible chance of winning at the Supreme Court. The Department of Justice (DOJ) has asked the high court to hear the travel ban case, which has been struck down multiple times by lower courts. But why are the president’s tweets such a legal foot-in-mouth moment? Admitting that the executive order is indeed a travel ban puts the administration in a precarious position—federal courts across the country have considered the president’s own statements, tweets, and interviews when ordering a freeze on the ban. DOJ attorneys argued, however, that some of Trump’s statements should not count as evidence. For instance, they reason that Trump’s proposal for a “Muslim ban” on the campaign trail should not be taken into consideration now that he is president. Only the text of the order itself, they say, should be analyzed in court. But there will be no need for the courts to reach back to his candidacy now when he is providing them with new statements that contradict DOJ lawyers. Attorneys of varying political stripes appeared to draw the same conclusion about the ill-fated tweets. Trump’s last attempt to push his travel ban through the courts ended with the judges concluding that it “drips with religious intolerance, animus, and discrimination.” Should Trump’s telling tweets be considered again, the Supreme Court ought to find the same levels of bigotry in plain sight.